Judging by yet another year of NBA season projections showing imbalance, we might as well start calling them the “Leastern” and “Bestern” Conferences. Yes, another season of exhilarating basketball action has commenced and the boys out west seem to again have the upper edge. An interesting note perfectly symbolizing the historical success of the west in this millennium is that since the Chicago Bulls three-peat from 1996 through 1998, 12 of the last 17 NBA champions have been the Western Conference representatives. If you want to look even more recently, five of the last seven champions have come from out west and so have the last two (the Spurs and Warriors.) One last piece to prove the point; while the two champions from the east this decade have come from just one team (the Miami Heat), all four title-winners from the west were different squads. So, with the 2015-2016 campaign now underway, we thought it would be a perfect time to run through our Western Conference divisional previews and predictions. Given the nature of competition in the superior half of the league, these picks were more difficult than those of the east. Without further delay, let’s kick things off in the Northwest division! Under new Head Coach Billy Donovan (pictured above), the Thunder are already off to an impressive start. Led by Russell Westbrook’s 33 points Wednesday night, OKC knocked off a popular NBA Finals pick, the Spurs, at home by a score of 112-106. With Kevin Durant back on the hardwood, simply put, the Thunder have too much firepower to not take home this division. Last year the only representative from this group to make the postseason was the Portland Trail Blazers, a team widely expected to regress dramatically with the loss of LaMarcus Aldridge. After finishing last season at 38-44, the Utah Jazz are a team on the rise. They’re young, athletic, and have great defensive big men, a combination that can definitely lead them to a second place finish in the conference’s weakest division — albeit just short of a playoff berth. They led all of the NBA in opponent’s points per game at 94.9 last season and another year of experience should only benefit this roster. Gordon Hayward and Derrick Favors are the biggest weapons on offense, but look out for Rudy Gobert to make some serious noise in the Defensive Player of the Year race. Look, the Minnesota Timberwolves — as much as fans may be sick of hearing this — are not quite there yet to seriously contend for a playoff spot. With that said, if Ricky Rubio can stay healthy and Andrew Wiggins builds on last season’s Rookie of the Year output, this team should easily surpass last year’s 16-win total. With the shocking passing of President of Basketball Operations/Head Coach Flip Saunders over the weekend, the Wolves are playing with heavy hearts. They picked up an emotional and inspiring season-opening win Wednesday and look for this team to make Flip proud by upping their win total to around 30. The Denver Nuggets had one of the most surprising victories of Wednesday’s 14-contest slate, dropping the heavily-favored Rockets in Houston by 20. If Danilo Gallinari (23 points) stays on the court and rookie point guard Emmanuel Mudiay (17 points, 9 assists, 11 turnovers) can adjust quickly to the NBA pace, the Nuggets might not be too bad. Count us as guessing that one or both of those things won’t happen, and Denver will miss the play of Ty Lawson (now with Houston). With all that Portland lost over the summer though, the Nuggets should still be able to avoid the basement. From first to worst, the Blazers are destined to finish in the cellar of the Northwest division in 2015-2016. We don’t expect C.J. McCollum to put up 37 points every night and not even the great Damian Lillard will be able to carry this roster above fifth place. Everybody talks about not having Aldridge, combining that with the loss of Wesley Matthews and Nicolas Batum in the off-season, that equals three out of the top four scorers from 2014-2015. They have nine players under 25 years old and could be the worst in the west this season. It’s almost comical to think that a defending NBA champion can be ranked behind a handful of other conference foes, but that’s exactly what some are predicting as the fate of the Warriors. Not only do the Thunder and two or three Southwest teams have the makings to challenge the Dubs this season, but some experts believe a team within their division could knock them off their perch. Stephen Curry showed absolutely no signs of a title-hangover on opening night and with the same starting lineup featured in the Finals back for more, the Splash Bros. and company should finish first in the Pacific division again. Is this the year where the Clippers get the second-round playoff monkey off of their back? Can Chris Paul finally make it to a conference finals or beyond? Being able to claw DeAndre Jordan from the grasp of the Dallas Mavericks over the summer was both controversial and critical, but there’s one other player who could make the biggest impact of all. Will Paul Pierce’s leadership and playoff experience lead the Clippers to the promised land of the third round of the playoffs? “The Truth” may very well be yes. The biggest shocker in the west this year may be a playoff berth for the Sacramento Kings. Now, combining Rajon Rondo and DeMarcus Cousins on the same starting unit could be a dangerous game. However, with an eighth seed potentially up for grabs in the conference come springtime, we see no better candidate than the Kings. It’s certainly been a while since Sacramento has seen the postseason, but this roster is deep with an uber-talented starting five and a solid bench led by Darren Collison and Marco Belinelli. Is this Kobe Bryant’s swan song and better yet, do the Lakers have enough to make a big jump from last season’s 21-win disaster? Kobe is obviously an x-factor but what we’re most interested in observing is the play of “second-year” player Julius Randle. If you remember, the 2014 seventh overall pick out of the University of Kentucky missed all but 14 minutes of last season after breaking his right leg in last year’s opener. Now he’s back in action and hopefully for Lakers fans, he can prove to be a viable second scoring option behind the Black Mamba. Right down there at the bottom of the Western Conference barrel with the Blazers — we believe — will be the Phoenix Suns. After Wednesday’s defeat at the hands of the Dallas Mavericks, it’s hard to find a way the Suns could be contenders this season. They sent Isaiah Thomas to Boston and Goran Dragic to Miami last year to try and clean up an influx of point guards, but with Brandon Knight and Eric Bledsoe now in the fold, Thomas and Dragic are being missed. A weak bench and having Tyson Chandler being the lone, true veteran on the roster is a recipe for disaster in Phoenix this year. 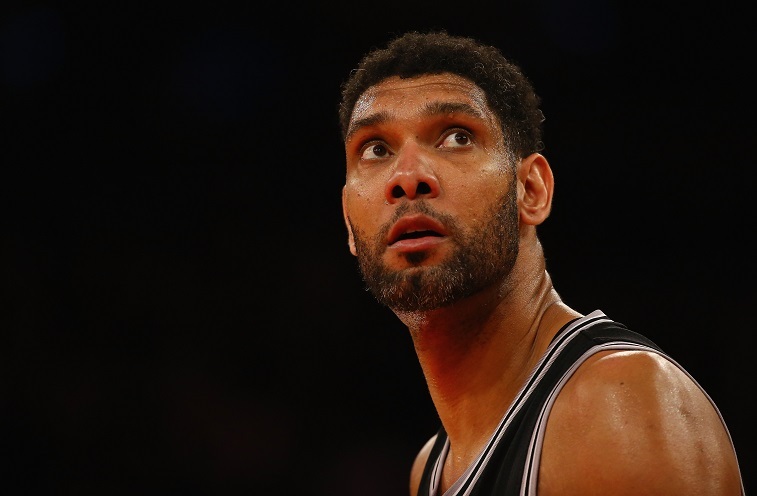 Tim Duncan is approaching eligibility for his AARP card and guess what, he’s still dominating opponents nearly half his age. The great thing for the Spurs is that “Father Time” doesn’t need to be the best or even second-best scoring option this season. With Aldridge and Kawhi Leonard joining him in the front court, the Spurs could be deadly this season. 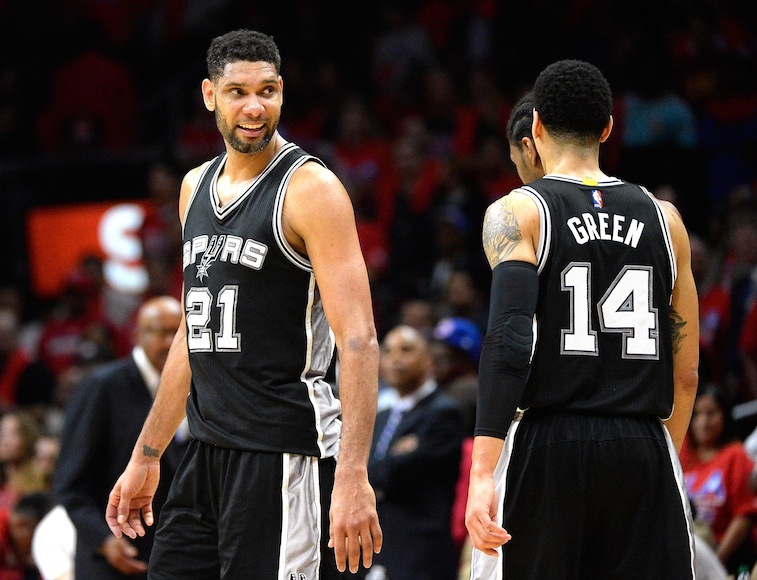 It’s almost impossible to see Gregg Popovich and Duncan failing in any way, so we’ll give them the one seed in the west. The Grizzlies had a somewhat quiet off-season, but what moves they did make were important. The Grizz keeping Marc Gasol as their starting center was just as important the Spurs keeping Leonard or the Chicago Bulls keeping Jimmy Butler. With Gasol dominating under the basket and the extremely underrated Mike Conley running point, Memphis still as a nice core. It was a ridiculously close Southwest race last spring as the Rockets finished with 56 victories and the Spurs and Grizzlies had 55 apiece. This time, we expect Memphis to distance themselves from Houston a bit more and come in second, earning the five seed. On the other side of the Nuggets’ surprising season-opening win is the Rockets dud. True, they didn’t have Dwight Howard for the contest (suspended one game), but in front of their home crowd, we expected Houston to come out victorious. With perennial MVP candidate James Harden coming off his best season yet, this team should make it back to the postseason as the six seed. The New Orleans Pelicans are off to an 0-2 start but in their defense, they had a brutal back-to-back beginning, starting against the Warriors. After a tough first game of the regular season, Anthony Davis was back dominating on Wednesday. If the Pelicans want to make the playoffs again, they’ll need Davis to at least replicate last year’s amazing year. We see Davis coming through at a near-MVP level and the Pels becoming the fourth team from the division to make the postseason. We all know about the tough summer in Big D. The Mavericks lost out on Jordan and instead got JaVale McGee, Wesley Matthews and a declining Deron Williams. Losing Monta Ellis will have a negative effect as well. Unless Dirk Nowitzki can turn back the clock a few years, this roster doesn’t have enough to compete in this monster of a division. All data (current as of October 29) courtesy of NBA.com, Basketball-Reference.com and ESPN.com.